A very enjoyable day birding around Akrotiri even if I got a later start than intended. Highlight was definitely finding a female Semi-collared Flycatcher as I was checking the ID’s of several females near Bishop’s Pool – also a female Collared Flycatcher which was actually my first Collared for the year. In that area there were also Pied and Spotted Flycatcher, Wood Warbler, Blackcap and several beautiful male European Golden Oriole. Plenty of Woodchat Shrike around with a few Red-backed as well. A large group of more than twenty Little Tern were on Lady’s Mile in the morning as were nine Collared Pratincole and many Marsh Sandpiper and Common Greenshank (see photos). Late in the afternoon I visited the eastern shore of the Salt Lake and the Zakaki run off. There I saw more than ten Temminck’s Stint, ten Black-tailed Godwit, a few Curlew Sandpiper, fishing Little Tern, feeding White-winged and Whiskered Tern and best of all – a resting flock of around 300 Collared Pratincoles (see photo). Lovely! Categories: Birding | Tags: Akrotiri birds, Akrotiri Salt Lake, Black-tailed Godwit, Collared Flycatcher, Collared Pratincole, Common Greenshank, Curlew Sandpiper, Cyprus Birding, Cyprus birds, Cyprus birdwatching, European Golden Oriole, Little Tern, Marsh Sandpiper, Red-backed Shrike, Semi-collared Flycatcher, Temminck's Stint, Whiskered Tern, White-winged Tern, Wood Warbler, Woodchat Shrike | Permalink. Although we managed to keep dry, a lot of our day out was spent dodging coming storms until one finally caught up with us at Lady’s Mile on Akrotiri. This definitely affected the species that we saw. However, Stuart, Sue and I did manage to fit in some good birds including male Pallid and female Hen Harrier, Lesser Kestrel including two very smart males, Semi-collared and Collared Flycatchers, a male Ortolan Bunting, several male Common Redstart with one of the samamisicus race and the stars of the day – a Baillon’s and male Little Crake at Zakaki Marsh to end the day. Categories: Cyprus Birding Tours Trip Reports | Tags: Baillon's Crake, Collared Flycatcher, Common Redstart, Cretzschmar's Bunting, Cyprus Birding, Cyprus birds, Cyprus birdwatching, cyprus trip reports, Cyprus Wheatear, Eurasian Stone Curlew, Great Reed Warbler, Greater Short-toed Lark, Hen Harrier, Lesser Kestrel, Little Crake, Ortolan Bunting, Pallid Harrier, Semi-collared Flycatcher, Spur-winged Lapwing | Permalink. Visited the eastern edge of Akrotiri Salt Lake this afternoon – my first visit there this spring. Although the run-off from Zakaki Marsh is dry there is still water in the Salt Lake. I found at least eighty Greater Flamingo, two Eurasian Spoonbill, four Black-winged Stilt, thirty Common Shelduck, thirty two Gull-billed Tern, eleven Little Tern and several Ruff, Little Stint and Kentish Plover. Before leaving Limassol I revisited both Akrotiri Gravel Pits and Zakaki Marsh where I had been in the morning. Of interest in the afternoon were a female Semi-collared Flycatcher in the Agios Georgios Church, a European Roller at Akrotiri Gravel Pits and a Temminck’s Stint at Zakaki. 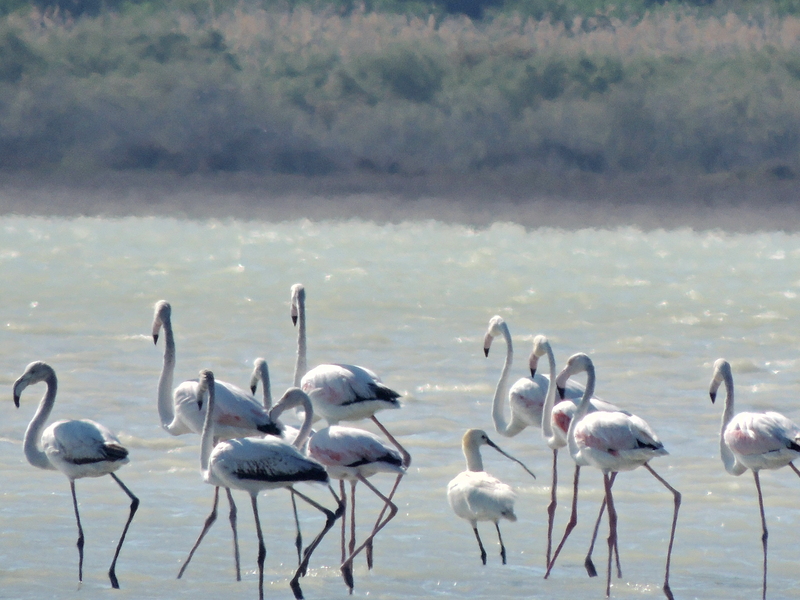 Categories: Birding | Tags: Akrotiri birds, Cyprus Birding, Cyprus birds, Cyprus birdwatching, Greater Flamingo, Gull-billed Tern, Semi-collared Flycatcher | Permalink.